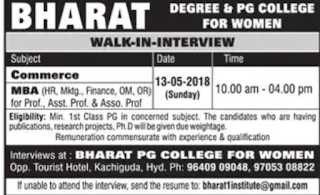 Bharat Degree & PG College For Women, Hyderabad has advertised in THE DECCAN CHRONICLE newspaper for recruitment of Professor/Associate/Assistant Professor jobs vacancies. Interested and eligible job aspirants are requested to walk-in on 13/05/2018. Check out further more details below. 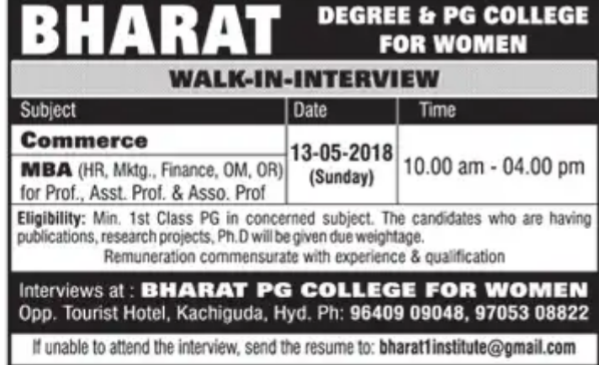 Name of the College :Bharat Degree & PG College For Women, Hyderabad. About College:The college is relentlessly working towards scaling new heights in the realm of education by actualizing its aims and aspirations. The students are encouraged not only towards excellence in Academics, but are also provided with a platform to realize, nurture and exhibit their innate talents through co & extra-curricular activities. In this process we are supported by an indefatigable team of professionally qualified faculty, who, with their heuristic ambience for the students to grow themselves into consummate human beings. Minimum 1st class PG in concerned subject. The candidates who are having publications, research projects,Ph.D will be given due weightage. Remuneration commensurate with experience and qualification. How to apply: InIerview at Bharat PG College For Women,opp. Tourist hotel,kachiguda, Hyderabad.